I spent Friday night and Saturday morning knitting what turned out to be the biggest newborn baby bootie ever. I can't figure out why it turned out so huge-- I did a gauge swatch, something I almost never do. So now I'm thinking with a little bit of embellishing it can be a Christmas stocking for the baby. My knitting mojo comes and goes. Do you ever get the urge to knit something new and exciting but just can't get started? That's what has been happening to me. I look and look and look at Ravelry and through my knitting books, hoping something will grab me, but nothing does. 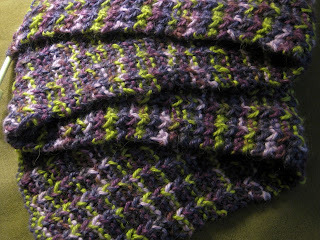 I did manage to finish the Yarn Harlot's one row scarf shown above. It's a little short, so I'm trying to decide whether to go ahead and bind off or order one more skein online. Dogwood came to visit today and we walked to downtown Willow Glen for lunch and a little shopping. 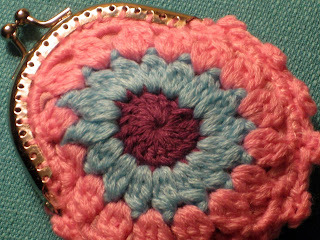 I bought this crochet coin purse I've been wanting for a while. It's not as cute as Thimbleanna's blue beaded purse, but I had to have it. Cute change purse, glad you got it! You and Dogwood together, how fun! Good morning! 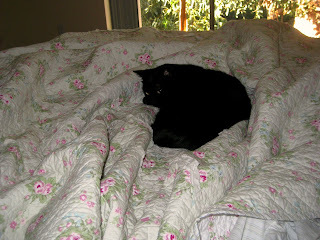 How did you sleep in your (and I say that with tongue in cheek) new bed? We have the same problem with AbbyDog - how does such a small creature take up so much room? 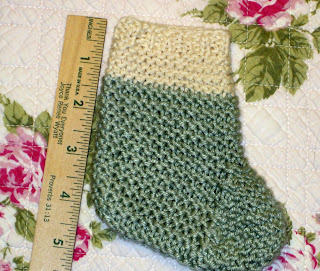 Cute baby bootie/Christmas stocking. Maybe Hilary's baby will have humongous feet...? Just kidding, but it really is sweet. I know what you mean about wanting to start something new but now quite knowing what to make. It's the same way for me with sewing. Sometimes I just end up messing around at the sewing machine, and no good can come of that! Yay! Baby's first Christmas stocking. Thank you everyone for your warm wishes. I love the change purse!!! It is the cutest! Pretty scarf, maybe you could add a button and make it a neck warmer. My cat has been hogging my pillow! I don't know why they think they own the bed! The little bootie is precious. Sweet baby will grow into them. The scarf so pretty. Love the colors. What fun we had yesterday. Great to see you in your new apartment. So nice for you to have the creek and huge trees nearby! Sorry I said that "bad work" but that barracade lady really got me angry!!!! OOPS. those kitties. They can be such bed hogs. Ours are the same way. I love the baby booty turned Christmas stocking! Oh don't you hate when that happens! I'm surprised. Maybe ditch the gauge on the next try. Mine usually end up too small or tight because I'm such a tight knitter. I'm usually lazy about making gauge swatches for small items because I figure it's the same amount of ripping. I like your one-row scarf. I made one also. It's just enough to tie around my next. Congratulations on becoming an aunt soon! Love the scarf and that cute little change purse! I think it will make a cute Christmas stocking! Cute coin purse!! How fun to have a new bed! I'll be mailing my ATC soon!